I’m enjoying a beautiful weekend up in Hermosa Beach, California. 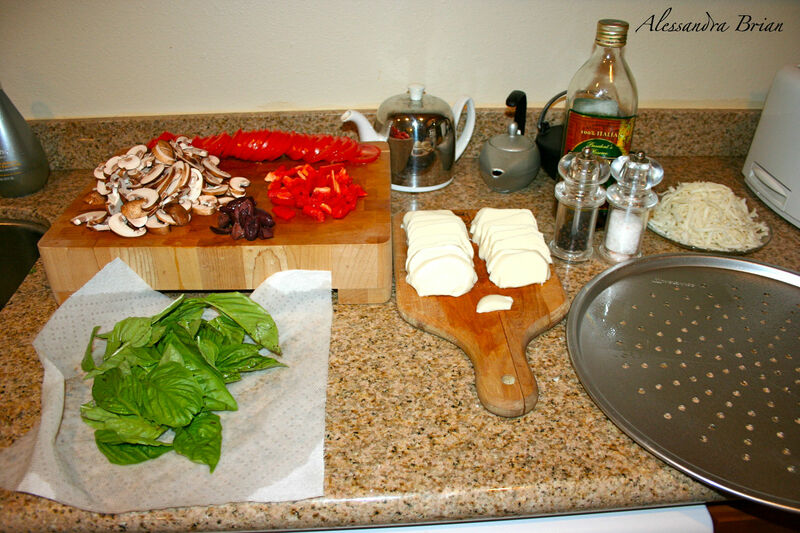 To accompany our movie night, we’ve decided to make some homemade pizza. There’s nothing like topping your own pizza with as much sauce, vegetables, cheese, etc. as you like. If you’re in the States and familiar with Trader Joe’s, I would recommend popping in and picking up a bag of their wholewheat dough already made. 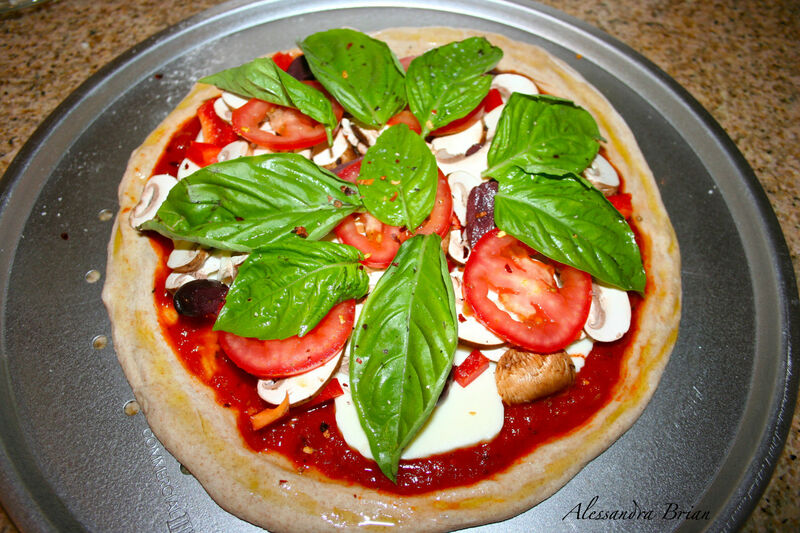 It’s quite easy to make dough, but we want pizza right now, and I love Trader Joe’s version. You can always stop into a local pizzeria and ask for some dough, or you can put your apron on and make it yourself. I’ll make this quick because I can tell (smell) my pizza is almost finished! Depending on the dough you have made or purchased, follow any instructions regarding letting it rise. Flour your dough and roll it out to your desired shape thickness. Normally i’m a thin crust kinda girl, but we decided to go for a thicker crust with the deliciousness of the wholewheat. Lay your floured dough onto a pizza pan or cookie sheet and brush lightly with olive oil for some crunch. Whatever you like! This is my favourite part about homemade pizza. 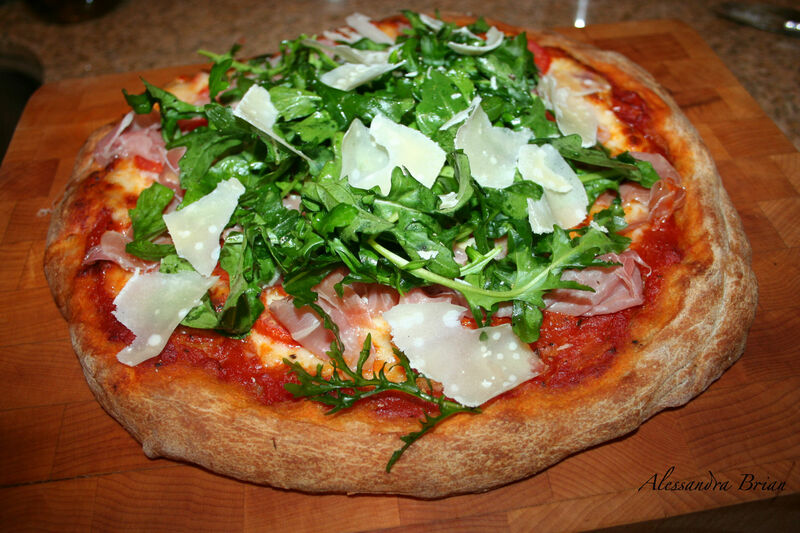 I would suggest using packaged mozzarella versus fresh mozzarella because the water makes the dough soggy. Other than that, anything goes. We put homemade tomato sauce, mozzarella, tomato, mushroom, bell peppers, olives, basil and lots of chill flakes on one. On the other, tomato sauce, prosciutto, arugula, and fresh parmigiano reggiano. Decadent, delicious, and not terribly unhealthy (depending on your toppings and portion control).